The generation of high-throughput data from sequencing and gene expression profiling experiments has resulted in an overabundance of information, making analysis quite overwhelming. Pathway analysis offers an approach that involves grouping thousands of molecules based on similarities, interactions, and components, thus simplifying the task of finding meaning in all the gathered information. Pathway analysis also allows identification of minor changes that might occur within biological systems at varying conditions, which may help in devising an explanation for a particular response to a stimulus. At the recent “BIO-IT World Conference and Expo”, several computational scientists and researchers shared their analytical tools, experiences, and expertise in using pathway analysis in their investigations. An enrichment analysis platform allows the enumeration and interpretation of genes that have been identified from genomics and gene-ChIP studies, according to Gary Bader, Ph.D., associate professor at The Donnelly Centre, University of Toronto. Dr. Bader also explained that there is currently so much information from genomics studies, resulting in a lot of redundancy in terms of raw information. Thus it is important to further analyze these datasets to delineate smaller groups among a huge network of genes. “We have developed the Enrichment Map, which is a visualization method that allows the user to identify functional themes within gene expression data. These gene sets, or pathways, reduce the complexity of the analysis because they simplify the interpretation of the dataset,” discussed Dr. Bader. Pathway analysis has helped Novartis perform research in two major aspects: patient selection and identification of drug combinations that may be useful for addressing unmet clinical needs, especially relating to drug resistance, according to Joseph Lehar, Ph.D., director of bioinformatics, oncology translational research. Dr. Lehar is also a member of a research consortium that has developed the Cancer Cell Line Encyclopedia, which is a compilation of cell line-specific data on gene expression, sequencing, and copy number that could be utilized in identifying various predictors for drug resistance and sensitivity. 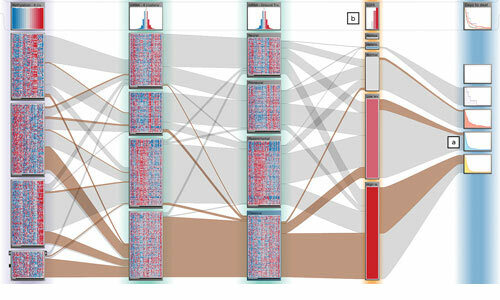 His group envisions that this unique dataset will enhance the design and development of personalized treatment schemes in cancer. “One challenge is that drug research in cancer involves the identification of mechanisms that could be targeted during therapy. Some cancers are dependent on a simple dominant mechanism of activation and progression, but other cancers are very heterogeneous, meaning that any one type of drug may not be effective for all patients. Alexander Lex, Ph.D., research scientist of the visual computing group of Harvard School of Engineering and Applied Sciences, said that visualization of large datasets of experimental data has allowed his group to identify changes in specific biological pathways when looking, for example, at cancer data. “Our Caleydo project was designed to bring biomolecular data into a visual form that helps researchers in finding relationships within large sets of data. Our approach can tackle various types of data, ranging from mutation, methylation patterns, gene expression, and microRNAs, to clinical data and pathways. “This enables, for example, looking at subtypes of glioblastoma. 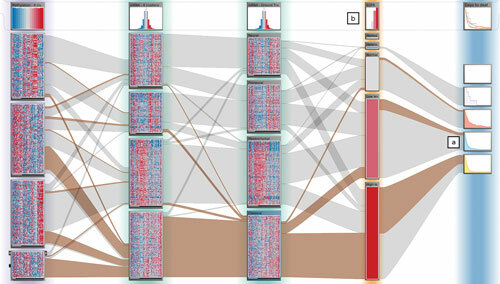 Distinguishing factors of cancer subtypes could be derived from experimental data, but integrating a wide variety of datasets enables researchers to characterize subtypes better, to find supporting evidence in the clinical data, or to reason about causes based on pathways.” He further discussed that Caleydo has been applied to various datasets and has been successfully used to analyze data from The Cancer Genome Atlas (TCGA). Dr. Lex has also focused on the modulation of behavior of genes for potential application in drug discovery. “It would be interesting not only to find out how a certain gene works, but also how a drug affects the gene and how this affects the rest of the pathway it is associated with,” explained Dr. Lex. Pathway analysis has also been used in studies involving secondary metabolism. “We look for families of genes that are associated with the biosynthesis of chemical compounds,” said Daniel Udwary, Ph.D., assistant professor, biomedical and pharmaceutical sciences, University of Rhode Island. Dr. Udwary plans to conduct comparative analyses of gene clusters among various microbial species to establish natural products-based drug discovery roadmaps. Pathway analysis has also helped scientists in elucidating mechanisms of drug action. According to Joshua Apgar, Ph.D., principal scientist of systems biology, department of immunology and inflammation at Boehringer Ingelheim Pharmaceuticals, their use of well-described pathway models has helped them understand drug selectivity and functionality. “We are inspired by the fact that some compounds show functional selectivity in vivo but are not selective in vitro. We are interested in identifying on-target and off-target mechanisms of new drugs and how systems-level processes can affect these mechanisms,” explained Dr. Apgar. 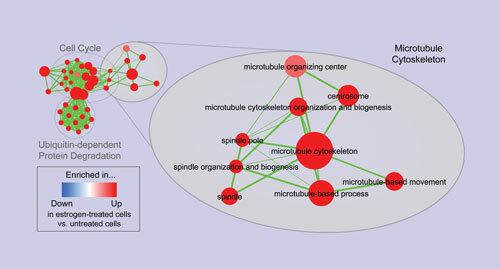 These processes are quite complicated and may be influenced by a variety of feedback processes that only exist in vivo. Reconstruction of all these processes in vitro may be impossible and thus the use of pathway models has assisted their investigations of drug target effects. Ingenuity Systems says its IPA technology helped elucidate a network of genetic drivers for aging. The networks determined, among other things, that muscle age was not primarily related to the biology of physical activity. Previously, research had hypothesized that resistance exercise contributed to a reverse of the aging process, yet work carried out by the laboratory of Professor James A. Timmons at Loughborough University in the U.K. demonstrated that response to exercise is highly variable in humans and that pre-existing gene expression levels can predict future response to exercise. The paper also identified biological molecules that may drive the response to physical activity. The new work coupled analysis with Ingenuity’s IPA software and microarray data generated both by Dr. Timmons’ laboratory as well as datasets from published literature. The analysis determined that the genetic regulators of age-related genes were distinct and unrelated to the regulators of exercise-influenced genes. 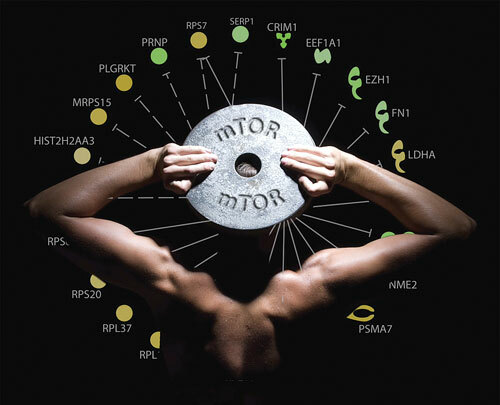 The research was published in the journal PLOS Genetics in a paper titled “Molecular Networks of Human Muscle Adaptation to Exercise and Age”. IPA (Ingenuity Pathway Analysis) is a web-based functional analysis tool for comprehensive omic data. Exercise isn’t the key to the fountain of youth: the answer lies in our genes.